Most of the time I wander through life showered with disappointments. From the moment I wake up with a head that feels like it’s being excavated by overenthusiastic borrowers to the moment I pass out, cold and alone. Fortunately amidst this endless parade of bleak misery is the odd glimmer of hope and it often comes in the form of a pub like The Florist Arms. At first impressions this could be mistaken for the kind of pub exclusively frequented by East London ‘creatives’ with their haircuts and ironically moth eaten jumpers. However it quickly becomes apparent that it is lucky enough to have a friendly and diverse crowd making it a very rich atmosphere of East end accents, trendy chat and bawdy thigh slapping laughter. Unless you’re just going in to abuse the toilet facilities because you have a pathetic bladder the prime reason for going to a pub is to insert food and/or drink into your face. On this front this is an exceptional venue. From lunch till close it’s difficult to resist temptation as discs of cheese laden dough are paraded past you from a pizza menu where most things are only a fiver. Whilst a pint will probably cost you a similar amount you do get to choose from a fair old selection of ale, ciders and lagers. Standard amber fizz is accompanied here by some more interesting continental lagers such as the suspiciously strong but very drinkable Belgian staple ‘Palm’. 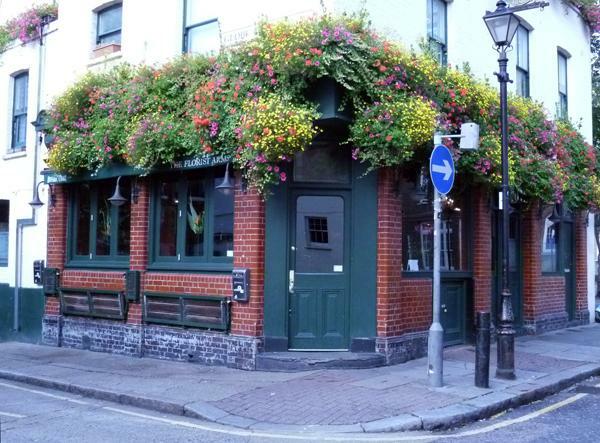 There’s limited space to sit outside but if the flower boxes are in bloom it’s worth popping out for a few inches of beer and have a gander at an extremely attractive pub exterior. Its position on Globe Road makes it fairly picturesque and when the ‘olden days’ street lights are lit and in early evening it’s nothing short of spectacular. Back inside the single room bar as dark sets in it’ll be bustling and boisterous with a backing track of eclectic tunes you’ve probably not heard in five years but will still compulsively sing half the words to. Tiny downside? Through no fault of its own The Florists Arms is stranded a fair way from any pubs I’m not confident you couldn’t hire a hit man in so it’ll probably be your only stop off. But this is a very much a pub you could make an evening of and is certainly one you should be going to soon as it is an oasis of pure joy in the tedious desert of existence.